TAK-875, a new treatment for type 2 diabetes, improves blood sugar control and is equally effective as glimepiride, but has a significantly lower risk of creating a dangerous drop in blood sugar, called hypoglycemia, according to a new study. 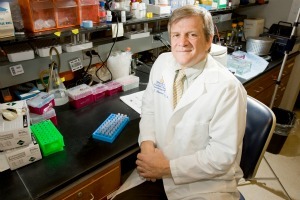 New type 2 diabetes drug, studied in a clinical trial designed by the University of Michigan’s Charles Burant, M.D., Ph.D., helps diabetics release more insulin and improve control of blood glucose levels. The results of the phase 2 randomized trial were published Online First Sunday in The Lancet. Type 2 diabetes is the most common form of diabetes accounting for 90 percent of the 150 million people in the United States currently living with the disease. It is primarily caused by a lack of response to insulin which leads to high blood sugar and a variety of chronic conditions. Free fatty acid receptor 1, also known as G protein-coupled receptor 40, or GPR40, plays a vital role in stimulating and regulating the production of insulin. It works by boosting the release of insulin from pancreatic β-cells when glucose and fatty acids rise in the blood, such as after a meal, which results in a fall in blood glucose levels. Drugs that activate the FFAR1 receptor have the potential to help diabetics release more insulin and improve control of blood glucose levels. TAK-875 is a novel oral medication designed to enhance insulin secretion in a glucose-dependant manner, which means that it has no effect on insulin secretion when glucose levels are normal, and as such has the potential to improve the control of blood sugar levels without the risk of hypoglycemia. At 12 weeks, all doses of TAK-875 resulted in significant drops in HbA1c compared with placebo. A similar reduction occurred in patients given glimepiride. TAK-875 was generally well-tolerated. The incidence of hypoglycaemia was significantly lower for all doses of TAK-875 compared with glimepiride (2 percent compared to 19 percent), and was similar to placebo which was 2 percent. The overall incidence of treatment-related side effects was similar for the TAK-875 groups and placebo groups (49 percent; all TAK-875 groups vs 48 percent), but higher in the glimepiride group (61 percent) because of the increased risk of hypoglycaemia. They conclude:“We are truly excited about the potential of TAK-875 and are eager to conduct larger trials to find out how well this drug works, how safe it is and what its place is in the treatment of diabetes. “TAK-875 significantly improved glycemic control in patients with type 2 diabetes with minimum risk of hypoglycemia. The results show that activation of FFAR1 is a viable therapeutic target for treatment of type 2 diabetes,” authors say. Disclosure: Burant is an unpaid consultant and advisor to Takeda Global Research and Development which discovered TAK-875.